Only in Jerusalem…This is the graffiti I found today in the bathroom of the Burgers Bar on Shammai Street. Ok, only in Jerusalem. But it bothered me. I don’t think defacement in the name of Torah can be such a good thing. 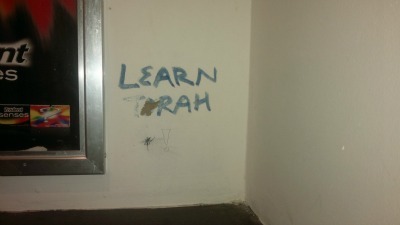 Just get out there and learn Torah… and you will see what it says about destroying somebody’s property. Something about “assur.” Same with the spray painted na-nach” and “tznius” messages on city walls. How is that making the right impression!? How about the rest of us basically very frum folks (I now get nervous to use the term chareidi – sorry) who walk by, past these graffiti signs, while the chilonim look at us and make negative judgements by association? Gets embarrassing. I had exactly the same reaction as Savta Ima. The message and the action negate each other. Graffiti is incorrect no matter what it says. why should it be ok to paint on someone else’s wall? True this is not a negative message but the fact that it is graffiti doesn’t fit with the idea of the message.